← >Mussomeli: "…as long as the government works with civil societies and with other groups the situation will improve over the next few years"
PHNOM PENH, Cambodia (AP) – A government minister on Friday branded U.N. human rights workers in Cambodia “lazy” and “clueless,” accusing them of giving their supervisors inaccurate information about the Southeast Asian nation. In the latest verbal assault on the world body, Information Minister Khieu Kanharith said the United Nations must reform its 13-year-old human rights office in Cambodia by bringing in “new blood” to do the job. His comments came after the U.N. expressed concern about the recent vebal attack Cambodia’s Prime Minister Hun Sen made against Yash Ghai, Secretary-General Kofi Annan’s special envoy. Hun Sen called Ghai “totally deranged” and demanded that Annan sack him for saying that the Cambodian government is not committed to human rights. She called on the government to continue full cooperation with the field office headed by Ghai, who is not based in Cambodia but visits every few months. Ghai voiced his criticisms Tuesday at the end of a 10-day Cambodia trip. Khieu Kanharith, who is also the government spokesman, blamed “extremely lazy” officials a the U.N. human rights office in Cambodia for giving Ghai an inaccurate picture of Cambodia. Cambodia’s human rights situation suffered a severe setback last year when Hun Sen launched lawsuits against more than half a dozen critics, including an opposition leader, a journalist and human rights activists. The Cambodian leader dropped his actions earlier this year following strong condemnation at home and abroad. >Hello,I am so despicable to hear what Prime Minister Hun Sen has recently verbally lashing out about Professor Yah Ghai and the United Nations. They say, “Don’t teach old dog with new tricks”. After 15 plus years that the United Nations and the international donor community have been providing all resources in trying to help rebuild and/or to build Cambodia and to promote peace and freedom for her people, and still this old dog has not learned a thing but to running wild and continuing to threat people’s lives.Like they say, “The frog lives all his life in the well and never had once come out of the well to see how big the world is.” Every word comes out from Prime Minister Hun Sen and his administrations’ mouth is “JUNGLE”. 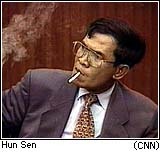 “CHE KE CHE AINH LENG, PREY PSAIY NAS DOUCH KMEAN KA TRES RESS KIET DOAL PAUL BRO YOUCH SOM RAB POL ROT KHMER NIENG AH-NA KUT BRO TES SOS”The Amoeba/Yuon and its puppet, Prime Minister Hun Sen, still think they can fool Cambodian people and the international community by pointing finger to the “Killing Fields” as a scapegoat to win their political battlegrounds over the United Nations and the international community. But let’s us remind you and your YUON PREY PSAIY that we are coming after whoever were behind the “Killing Fields”.Let’s be remind also, your lawsuit that was filed by the people against you when you came to New York, late last year is still pending. It was bargained for you to iron things out strictly on the conditions that you need to do to improve the situations in Cambodia, which include promoting and adopting the democratic political process and for “the international community to monitor respect for human rights and fundamental freedoms and to cooperate with the government and civil society in order to ensure that the standards accepted by the government are observed.” KMEAN DIERNG MONG AH-VEIY SOS, HA TE MOUTH MEN KIET! CHES TE KOM KUOT KNEAR TVER POK ROLUOY!